Mindtree, the mid-cap information technology (IT) product and services firm, hit by a series of bad news recently, seems set to get back on track. The Bangalore-based company has revamped itself as it aims to simplify its business structure and focus on being a specialist in certain areas. "The discussion has been going on over the past two to three months. After our restructuring in 2008, this will perhaps be one of the largest and significant rejigs. This is also a part of the directional strategy the company will take as it steps into the new financial year. One of the key elements of this rejig has been to chose segments that we do not want to be in," said Krishnakumar Natarajan MindTree chief executive officer and managing director. As part of this rejig, it has consciously chosen to move out of certain segments and to consolidate some divisions. 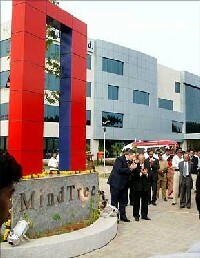 MindTree now has two market-facing segments - IT services, and Product and Engineering Services (PES). The change will be effective from April 1. Under its IT services focus, MindTree will have four major verticals - banking and finance services and insurance, manufacturing, travel and transportation and others. It has opted to move out of energy and utility. "The idea of rejig is to focus on niche areas, where we will be counted among the top five players in the next few years. We have also found customers are looking for partners who are specialists in certain areas. Though we do have some clients in the energy and utility space and it is growing well, I do not think that in the next five years we can be among the top players in that segment," said Natarajan. For instance, in terms of focus, within the manufacturing vertical, the company will focus only on the consumer and packaged goods and automotive segment. Similarly, under the PES segment, MindTree has consolidated its research and development services, software product engineering (SPE) services and Next in Wireless (NiW) units. To provide end-to-end services, the company has consolidated its data & analytic services. Data warehousing and business intelligence practice and knowledge services will be combined to form Data & Analytics Solutions (DAS). In terms of growth enablers, the company has identified three horizontal offerings: DAS, infrastructure manufacturing services (IMS), and independent testing. These three segments will run horizontal across verticals. The company recently closed $70 million (Rs 315 crore) worth of two deals in the IMS segment. Since the company is moving out of certain segments, it is expecting some impact on customer base. "We do not see impact on our revenue lines as we will focus on new business. But the impact will be there on the customer base. As of December 30, 2010, we had 269 active clients. But because we are moving away from certain clients this might see some impact," said Natarajan. For clients within these segments, Natarajan said the company would have a transition process. Anjan Lahiri will continue to head IT Services and Janakiraman S will head PES. Scott Staples will head the newly formed DAS. Parthasarathy NS will continue to drive IMTS & Testing. The rejig announcement comes as the company has been facing several problems on both operation and management levels. Recently, it announced its decision to move out of its mobile product business, which it entered after acquiring Kyocera's R&D unit. It had invested around $4.5 million (Rs 20 crore) over six months since April 2010. "We have not moved out of the mobile business completely. The time when we entered the segment to now has changed completely. Besides, the entry of Android and the sudden spurt of mobile manufacturers changed the landscape. The market did punish us for our strategy and for our experiment. But if this would have worked the other way round, the story would have been different," said Natarajan. The company had to spend around $3.7 million as restructuring cost to wind up the handset business. But there are lessons learnt from this, too. According to Natarajan, from this experiment the company will not get into the consumer device segment or into markets that change rapidly. "So, as a strategy, we will continue our focus in the bluetooth-related intellectual property segment and also the digital platform," he said. Natarajan is confident the strategy to be different in the market will work out. He is also expecting the non-linear play to pan out in a few years. "Focus on mobile technology like bluetooth, digital platform, software-as-a-service in the CPG segment, platform approach to the IMS unit will pan out. At present, these non-linear initiatives are just two to three per cent of the total revenue. We see this going up significantly," said Natarajan. Analysts are in a wait-and-watch mode. "I do not have details of the rejig plan. If it is just a regrouping exercise, then it is not a big change. But if they are talking about exiting from certain verticals if growth is good, then we will like to know why. I will be more interested to know the outlook on the R&D and SPE segments, as growth has been slow. For instance, R&D was 14 per cent of the revenue in Q1 FY10 and went down to 12 per cent in Q3 FY11. Similarly, SPE was 29.3 per cent in Q1 of FY10, as of last quarter, it has come down to 24 per cent," said an analyst of a leading brokerage house. "Most mid-cap firms will have to find a niche and try and diversify in that segment. MindTree is also trying to do that. But we will like to get some clarity on their strategy," said another analyst.